Like your success depended upon it. Because it does! It's a powerful and integrated software to manage all your documents; all the files necessary for the success of	your organization. The more documents you have the more you need a reliable, scalable, and fast document management software. infoRouter will help you manage your limited resources effectively by automating the most difficult tasks associated with version control, imaging, document indexing, electronic forms, document delivery, document retrieval, searching and finding relevant content, routing documents for approval (workflow) and creating custom portals for your staff, customers and business partners. It can also help reduce your risk and costs associated with e-discovery and a growing number of regulatory compliance and Corporate Governance processes such as those related to the Sarbanes-Oxley Act, HIPAA, ISO Document Control and Certification, SEC and DoD 5015.2 Records Management guidelines. 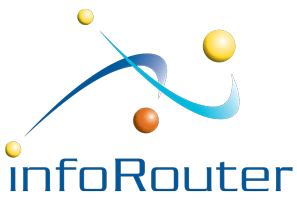 infoRouter includes Workflow, Document Routing, Electronic Forms, Scanning, Storage, Archiving, Indexing & Records Management modules under a single integrated EDMS software suite. infoRouter is a scalable software solution (EDMS) that can help small to medium sized business take their business performance to the next level. infoRouter is also the EDMS of choice for many multi-national companies and government agencies all over the world. It is simple to implement and intuitive to use in the small to medium size companies looking for departmental solutions or large-scale environments with thousands of users and millions of documents. Our customers reduce their costs and gain significant improvements over their existing methods without having to change how they work. infoRouter will adapt to your existing workflows and can dramatically improve the way you deal with documents by providing the tools you need in your day-to-day activities. Ridiculously easy! Unlike with other enterprise class document management systems, you do not need an army of expensive consultants to implement infoRouter. You should be up and running in just a few hours. You’ll be surprised how easy it will be to roll it out to your entire organization. infoRouter can automate your business processes using the built-in business process automation (BPM) tools to drive efficiency and productivity across the board. infoRouter's Document Capture Automation provides an efficient way to capture all kinds of documents in electronic form. You can digitize paper documents (scanning), create digital content using the built-in tools or simply upload desktop documents to the central document warehouse. Whether you work in paper documents, forms, records, pictures, audio, video, images, scanned documents, office documents such as Word, Excel, PowerPoint, infoRouter can manage any type of document or file in its native format. infoRouter also offers many tools to help in Document Assembly and Document Delivery. Using the Forms Management module, you can create flexible forms to create content or capture data easily. The document delivery mechanism which is built into infoRouter ensures that all the stake holders are informed when documents are created, updated and approved. Full-text search and document indexing offers the ability to find documents within seconds. Content search, Saved search, Category search and advanced meta search are just a few ways you can access your documents whenever you need them. It also ensures that the correct version of the document is delivered to avoid confusion and errors that is a common problem in many businesses. To gain a competitive edge, you must make the decision to invest in an industrial-strength document management system like infoRouter to organize, store, secure, safely share and manage your enterprise content and documents. Give us the opportunity to show you why we are so confident that infoRouter will be able to transform the way you manage your documents. infoRouter will change the way you look at enterprise document management software. DID WE MENTION THE API? The infoRouter web services API provides access to the power of document management to your existing applications. You can build interfaces to infoRouter from your internal systems and exchange data to automate your critical business processes. Route your invoices to the right people to build an effective AP Automation solution or route incoming documents and emails so no important document gets stuck in someone's inbox. Call to ask us about the many solutions our customers have implemented. Click here to learn more about the infoRouter web services API. "Thank you for being so prompt and efficient with your support and assistance. Of late I have seldom had the experience to interact with vendors and support personnel with your pronounced sense of pride and dedication, thank you!" "We serve hundreds of users across multiple offices around the globe. Collaborating on engineering documents so effectively would not have been possible without infoRouter. " Kim Waller Chemtex International, Inc.
"Our implementation of infoRouter is fast, easy to manage and user friendly. The response from our end users is positive and the support staff at Active Innovations is very responsive to our requests. We use infoRouter for document management, keeping track of records and version control." Robert D'Amato, Sr. Help Desk Analyst, RS Information Systems, Inc.
"Tremendous improvement in our workflow. Mistakes are down to a minimum. We can now get much more done in far less time." Glen Marshall. Lockheed Martin Graphics & Proposal Development Center. "I have just completed my first proposal using infoRouter and the system is fantastic. It allowed us to make sure we had the latest and greatest copy of everything. It eliminated configuration control problems. It allowed us to enforce cut-offs. The engineers love it. I feel like a kid at Christmas"
"The response from our users has been overwhelmingly positive. The learning curve is minimal, and the benefits are obvious to all." Robert Conway, Manager of Internet Communications. Xelus, Inc.